PHS junior Brian McClelland throws Wednesday during the Warriors' 11-5 victory over Sweet Home. Philomath teammates Brooks Stearns, left, and Marshall Brattain bump fists after Brattain scored a run. Philomath senior Brooks Stearns dives at home plate to try to make a tag on a Sweet Home runner. The runner was called safe. Philomath freshman Cameron Ordway throws to second baseman Michael Slater on a force play. Philomath junior Dylan Bennett connects in Monday's game at Sweet Home. Philomath's Brandon Vogler pitches against Sweet Home. Philomath's Calvin Snuggerud gets hit by a pitch. Philomath's Adam Hernandez catches a line drive in right field. Philomath's Brian McClelland stretches for a put out of Sweet Home's Zachary Zanona. 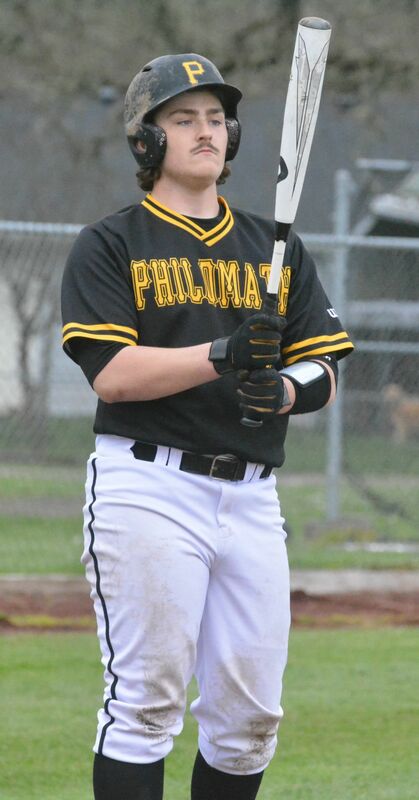 Brody Hiner hits a ball down the line for Philomath. Brooks Stearns puts a ball in play for the Warriros. Philomath's Cameron Ordway puts a ball in play for the Warriors. Philomath's Marshall Brattain started against Sweet Home. Philomath's Brody Hiner records a force out at third base. Sweet Home's Aiden Tyler slides under Philomath's Michael Slater on a steal of second base. Philomath's Adam Hernandez lays down a bunt for Philomath. Teammates greet Philomath's Cameron Ordway after he scored for the Warriors. Philomath's Michael Slater puts a ball in play for the Warriors. Sweet Home's Colton Smith dives back to first as Philomath's Brian McClelland receives a pick off attempt throw. Philomath's Cameron Ordway slides safely into home in front of tag attempt by Sweet Home catcher Travis Thorpe. Philomath shortstop Cameron Ordway tosses a ball to secondbaseman Michael Slater to record an out against Sweet Home. Philomath catcher Brooks Stearns catches a pop fly by the Sweet Home dugout. Philomath's Seth Staten won the triple jump at the relays meet at Stayton. Grant Hellesto runs a leg on the winning 4-by-800-meter relay. Philomath's Melia Morton won the long jump at the Stayton Relays. Philomath's Ari Manning tied for first in the high jump both at Stayton and Junction City last week.